I have been a biker most all of my adult life. Most all of my friends are bikers ( male & female). We ride only Harleys' and we smoke pot. We've been doing it for over 40 years. For the most part we have lived happy and fulfilling lives. None of us were alcoholics or suffered from liver damage. We all have great kids and grandkids. We still smoke pot , especially on road trips. For us , it's a non-issue. I do not get stoned, either. I smoke one small pipe before going to sleep. That's enough for me. Once done I roll over and nod off peacefully thereafter. I don't know what the fuss is all about... it's not like weed was hard to find before in Canada.. now you have to go pick up it with valid ID and it's and more expensive... I prefer it being delivered, cheaper and privately owned. It's not going to change anyone's habits overnight... It's like the legal drinking age in Quebec.. 18 is just a suggestion. now you have to go pick up it with valid ID and it's and more expensive. A big advantage of legality is quality control. When you buy "on the street" you never know for sure what you're getting. Another is ending the pointless prosecution of mostly harmless people. Now that it is legal there are a lot of first time users who think of it as big deal. I listened to an interview on the radio last night with a senior who described it as a coming out of the closet experience. He said that he kept his smoking to himself for over 50 years because of the stigma attached to it. He was quite emotional that it is now legal so for him it is a big deal. I would say that not having a criminal record is also a very big deal. Hopefully it would also cut down on the consumption of those "legal" garbage synthetics. I don't know if those are floating around in Canada, but here in the States they are and they put people, sometimes in groups, into the hospital from time to time. Even back in the day it was no different. It was called 'dusted'. You could either see tiny crystals or you could smell it. Unfortunately since you bought it there wasn't anything you could do about it so you were real picky about who you did business with. A friend of mine when I was in the military smoked what they found out to be "dusted" back in the 1970's, he jumped off a bridge thinking he could fly. That 'dust' was pcb's. A dielectric and coolant fluid for electrical apparatus. Very nasty stuff. Formaldehyde was also used. Usually it was given as a sample. Try it...you'll like. Make you come back for more. Then came that synthetic garbage that really messed things up and still available today only its much much worse. It either fries your brain or puts you six feet under. Fortunately, the stuff my sister and I get is 100% natural.... no additives of any kind. We neither want or need anything that's 'dusted' with crap that sends one loopy, just the straight up pot. Could be that's what made me ill all those years ago... additives. Yes they do. My point exactly. With poppies you have to do stuff to them to extract what's in 'em. With cannabis you just pick it, clean it and that's it. Done. Um, bracesbox, that's what I wrote. Not word for word, but certainly in the same context, tone and order of things. LOL, yup. That is really weird. 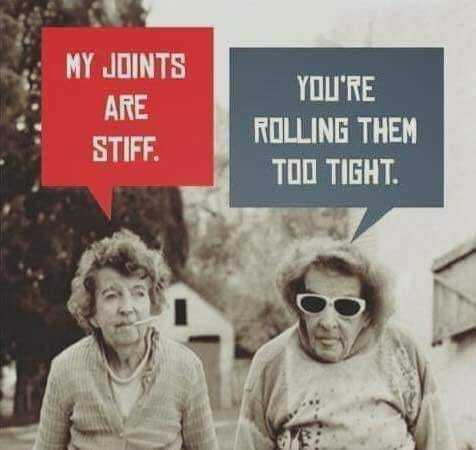 .... even down to the hip, knee and lower back pain.... AND the toke smokin' sister who suffers the same ailments and made the case for a bit o' pot. Oh, and let's not forget about not holding one's breath regarding legislation. Hmmm, have my sister and I got alternate selves in a parallel universe, and the other me is somehow posting here? alternate self in a parallel universe, and the other me is somehow posting here?